Daniel Gates is known as a “fixer”, someone who uses a variety of skills in order to collect obscure artifacts for his clients. He recently completed a high stakes mission in obtaining a a mirror made from human bone for a powerful corporation and is set to collect his payday before he is offered another job – travel to an obscure Scottish distillery to obtain a large bottle of mysterious whisky known as The Zero Malt. Gates is unable to turn down the offer with the promise of quadrupling his fee and having his history wiped clean with new papers. Gates boards a train to Scotland and with plenty of time to kill and daydreams about calling it a career after this one more job swirling around his head. He decides to take a peek at the package given to him by Rothschild to use in exchange for more of The Zero Malt. The book is a custom leather-bound book that bears the marking “Choronzon’s Grimoire” and is filled with handwritten script that details the history of numerous occult objects and is full of indecipherable drawings. It is here that Gates discovers the true meaning of the mirror he handed over to Rothschild. Gates loses the book on his travels but decides to take the meeting anyway, hoping he can salvage the deal with some smooth words and a more enticing offer. When he arrives on the island of the famed distillery, he is stunned by what he finds. 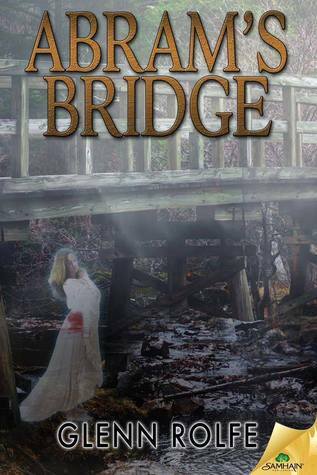 Abandoned on the island with no way back, Gates has no choice but to try to make a deal. The distillery is seemingly empty, but Gates can’t shake the feeling that someone or something is watching him. What follows is a fever dream of events that finds Gates struggling for survival as he is plagued by horrifying visions that make him question his sanity. Gates is an interesting character, a suave confident jack of all trades who has connections to black market items. He is a shadow, someone who manages to get his business cards to potential clients at just the right time. The air of mystery around him is what immediately draws the reader in, but what makes him standout is his very realistic portrayal. He has very real faults and has made numerous mistakes throughout his life and career. Despite his professional reputation and the things that he has undoubtedly seen, he also doesn’t seem to have all the answers. He finds himself in very real danger and at times you begin to see a vulnerability appear in him. Lee is a supreme talent when it comes to building a sense of atmosphere and that is evident not only in The Lucifer Glass, but his other works as well. His writing is detailed and full of rich imagery that engages all the senses and helps immerse readers in the worlds that he creates. 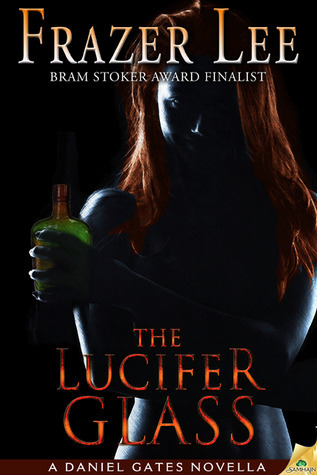 The novella format works extremely well for The Lucifer Glass, creating a fast-paced read that quickly drops the reader into a world of psychological horrors. While certain aspects of the story seemed to be a bit confusing at times, I thought The Lucifer Glass was a fun read and I think it will appeal to those who enjoy occult-based horror. Lee has at least another two books planned in the Daniel Gates universe, but I hope the stories continue well beyond that! Ever since I read Glenn Rolfe’s debut novel The Haunted Halls, I had a feeling he was destined to be one of the most exciting new authors to break out into the genre. It was a no-holds-barred novel that blended psychological horrors and blood and guts violence for a memorable debut. Rolfe takes that adrenaline-fueled approach and applies it to his latest novella for Samhain Horror, Boom Town. In 1979, the sleepy small town of Eckert, Wisconsin was shaken by one of the most unusual UFO sightings in history. A young couple was driving through town late at night on Hollers Hill when they witnessed a UFO blast a blue beam into the hill and caused an earthquake-like event that reverberated through the town and was reported to stretch across state lines. The event has become ingrained into the local folklore with residents split as to what actually occurred that night. Some believe every word of the event while others dismiss it as an exaggerated tall-tale. However, thirty years later when the town begins experiencing regular tremors, the events of that night begin becoming the talk of the town. Theories ranged from the alien connection to underground creatures to a secret oil line installed by the government to stash oil. When local business owner Alan Packard heads down to Kasey’s Cave, two local fanatics Gus Jackson and Nat Gallant claim much more is going on than just the seemingly harmless booms. They mention that resident Lyle Everson hasn’t been seen in over a week, right after a boom occurred in his backyard. Alan thinks it is nothing serious, he’s either sick or the two men simply let paranoia overtake them due to the booze, but Nat mentions that is not like him. In the twenty years he worked with Lyle, he never recalls him missing a day of work and he never answered his door when he went to check on him. There was no doubt he was there, Nat could hear him breathing heavy and noticed a rotten smell emanating from his home. It isn’t long between the booms hit Packard’s back yard and he learns firsthand the frightening consequences that follow their arrival. The following morning, 12-year-old Brady Carmichael and his best friend and crush Kim Jenner discover a pipe behind Packard’s Flea Market that was unearthed by the booms. This marks the first time the booms occurred so close to Brady’s house and he is eager to investigate despite Kim’s warnings that they should stay away. Contained within the pipe is a bubbling, blue ooze that could either be toxic waste or something far more sinister. Brady’s youthful curiosity gets the best of him and he touches the ooze to frightening consequences. The two young teens continue to explore the mystery of the ooze on Packard’s property and what they uncover has terrifying consequences for both them and the rest of Eckert. It is no secret to regular readers of The Horror Bookshelf that I am a huge nerd when it comes to aliens. Anything from true accounts to novels and movies, if it has aliens in it, there is a good chance I am going to enjoy it. While what terrifies me the most is your more traditional alien story (grey aliens and abductions), the utterly creepy portrayal Rolfe lays out here made my skin crawl. The blue ooze that marks the presence of these visitors from another world is frightening. At first glance the blue ooze seems relatively mundane, causing characters to lower their defenses so it can take hold of its victims without them ever seeing it coming. Imagine if you were walking around in the woods and stumbled upon this mysterious substance. Chances are you would be curious in the same way Brady was, not paralyzed by fear like you would be if you happened to encounter an actual entity. However, the ooze is capable of truly horrifying things and leads to some gruesome and memorable scenes. I don’t want to spoil the oozes capabilities, but the haunting mantra that surrounds it –“Take them. Bring them. Ascend” – will send chills down your spine! I love what Rolfe did structurally with this novella by opening with a news report detailing the strange underground “booms” that have been regularly occurring over the past three days. It is a perfect way to explain the history behind the town and what the booms could mean and sets the stage for the horrors that unfold throughout the story. Much like his previous novella Abram’s Bridge, Rolfe crafts the perfect portrayal of a small town and manages to create a diverse and interesting set of residents. My favorite supporting characters were the fanatics Gus and Nat, regulars at Kasey’s Cave who spout all kinds of conspiracy theories and refuse to believe anything other than the booms being connected to alien activity. 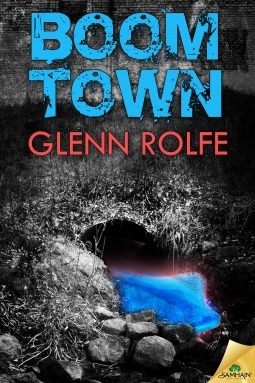 Rolfe’s decision to set Boom Town in a small town was a perfect fit for this type of novella. While I have enjoyed numerous alien movies where they move on large cities in a display of power (think of the White House scene in Independence Day), there is something utterly creepy about a sinister force that descends on an unsuspecting population. The only complaint I have concerning Boom Town was that Brady’s interaction with the ooze raised a lot of questions but had no real explanation or resolution. It didn’t significantly impact my reading or enjoyment of the story, but it was something that nagged at me when I realized there was no definitive explanation. I have my own theories, but it still does not answer why Brady was the only one to experience this reaction to the ooze. Boom Town is a fun, fast-paced read packed with action, copious amounts of alien slime and an aura of creepiness that is sure to appeal to both horror and science fiction fans. Rolfe leaves just enough of the mystery surrounding Eckert unresolved for a possible sequel and I hope that he decides to delve more into the events that began in Boom Town! 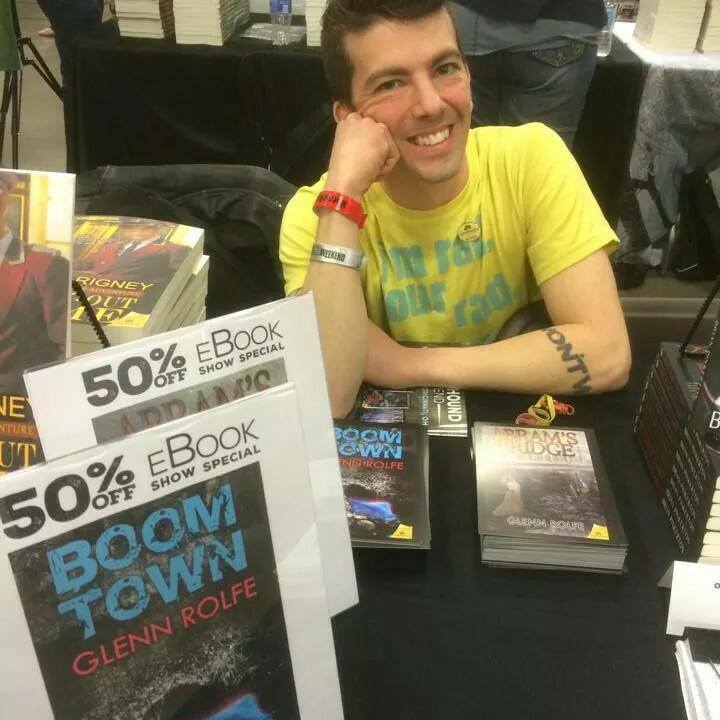 I am excited to announce that Glenn will be posting a guest post on the 13th and stopping by for an interview on the 20th as part of his publicity tour for Boom Town, so be sure to stop back on those dates! Also, be sure to check out the other great sites that will be hosting reviews, interviews and guest posts on his tour page (which you can find by clicking on the tour graphic below).